With its double porches, elevated entrance, and graceful symmetry, the home’s façade nods to antebellum architecture, but its clean lines and black window mullions are decidedly modern. 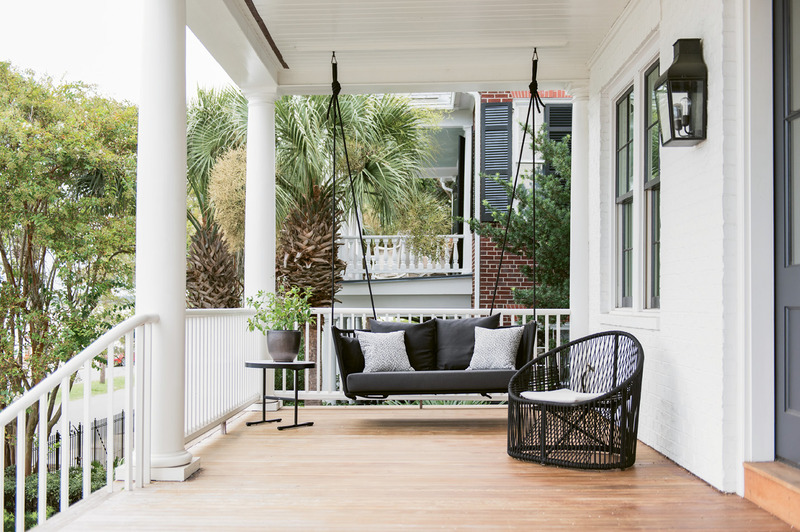 A sculptural loveseat-size swing by Spanish company Kettal provides a modern twist on the classic Charleston front-porch experience. Molly Fienning in the living room near an abstract painting by Brian Coleman; “I fell in love with his work at the George Gallery downtown, so we commissioned him to create sister paintings that complement one another,” she says. When viewed from the side, the home seems to morph into something more modern. 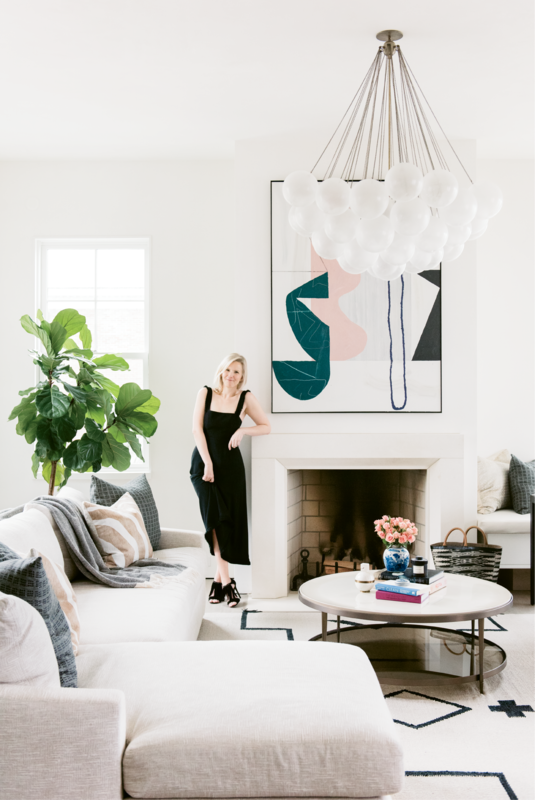 “We call it traditional up front, party in the back,” jokes interior designer Cortney Bishop. In this informal entry, Exquisite Surfaces “Commune” cement tile in the “Navajo Zebra” pattern sets a playful tone. “It’s a lively welcome to the house via our side doors, which most friends and family use,” Molly notes. 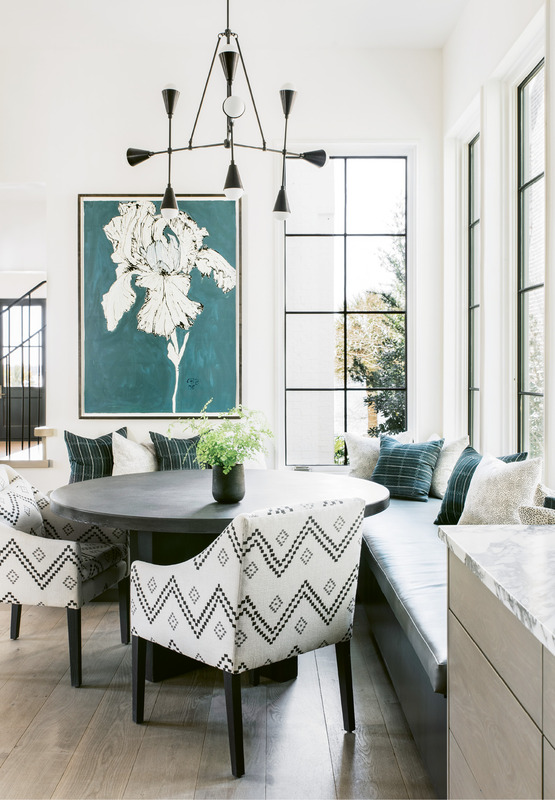 In the dining room, sculptural elements such as the Apparatus “Cloud” light fixture, Kelly Wearstler dining chairs, and a custom Merida rug woven with leather straps are like functional works of art. 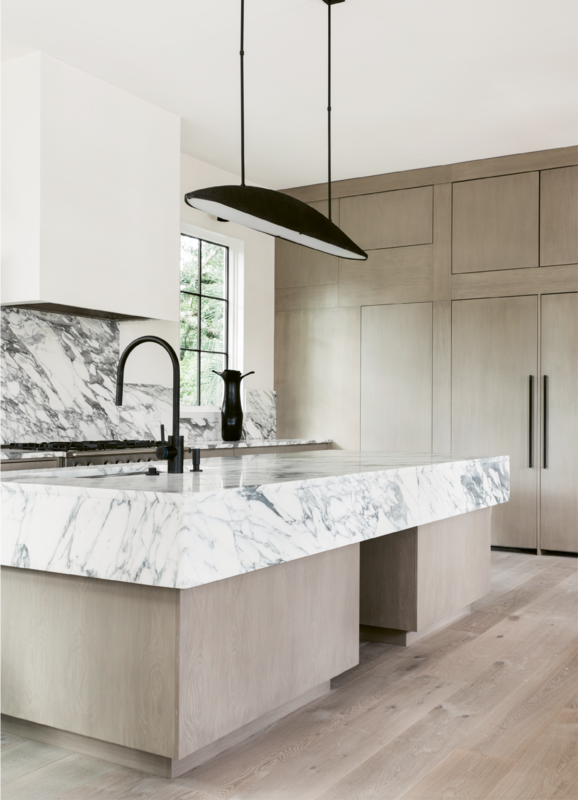 In the light and airy kitchen, white marble countertops with bold black veining make a strong visual impact. Ted serenades Fox in the nursery amongst pillows upholstered in playful comic book-inspired fabric. The banquette is the family hub; all gather around the concrete-topped table for meals, board games, and homework. 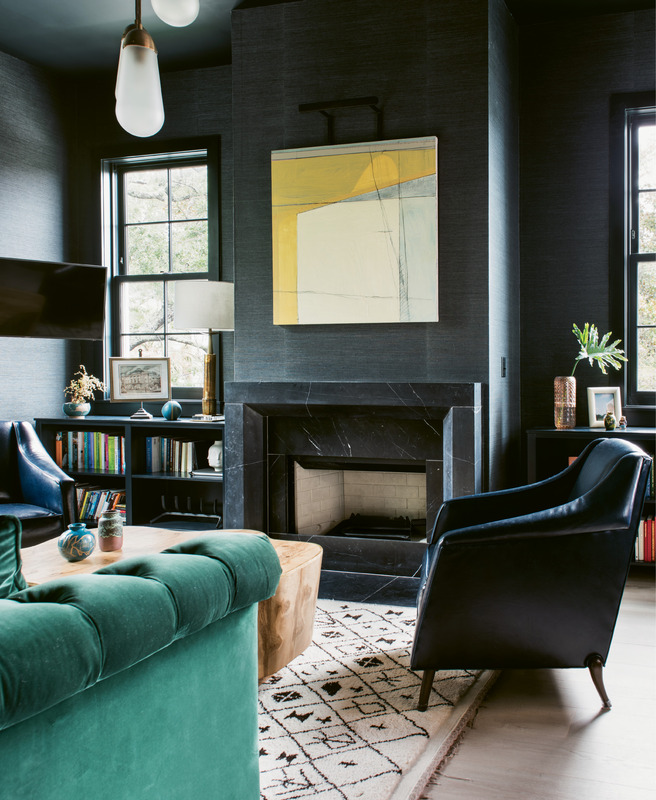 Molly and Sawyer read in the library, where the Phillip Jeffries “Manila Hemp” wallpaper in “charcoal” and Hickory Chair sofa upholstered in emerald-green velvet by Ralph Lauren set a moody, masculine tone. Over the fireplace, an abstract by artist Frank P. Phillips adds a dose of color. 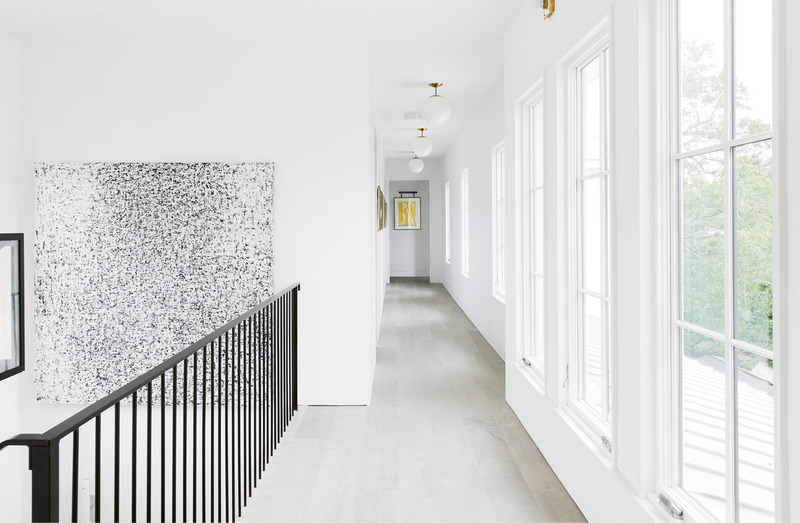 A custom black-and-white piece by Belgian artist Sabine Maes makes a statement in the upstairs hallway. 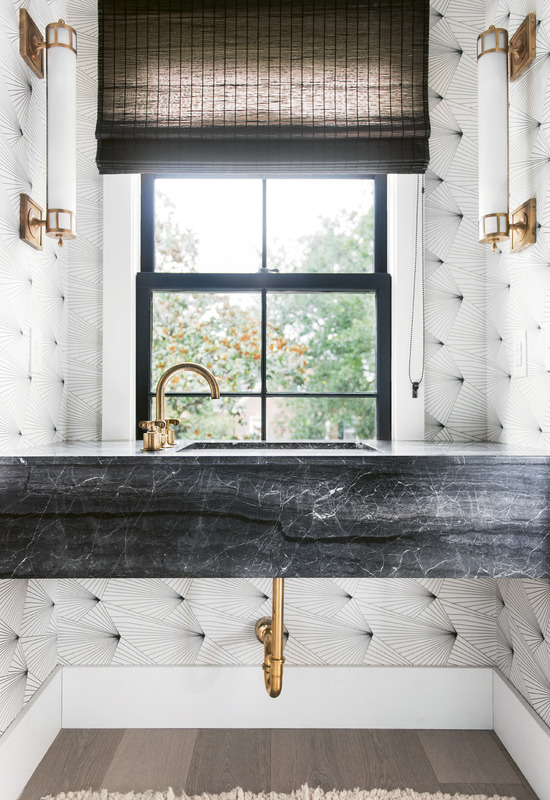 This powder-room isn’t upholstered, it’s a trompe-l’œil effect created by Erika Wakerly “Fan” wallpaper. 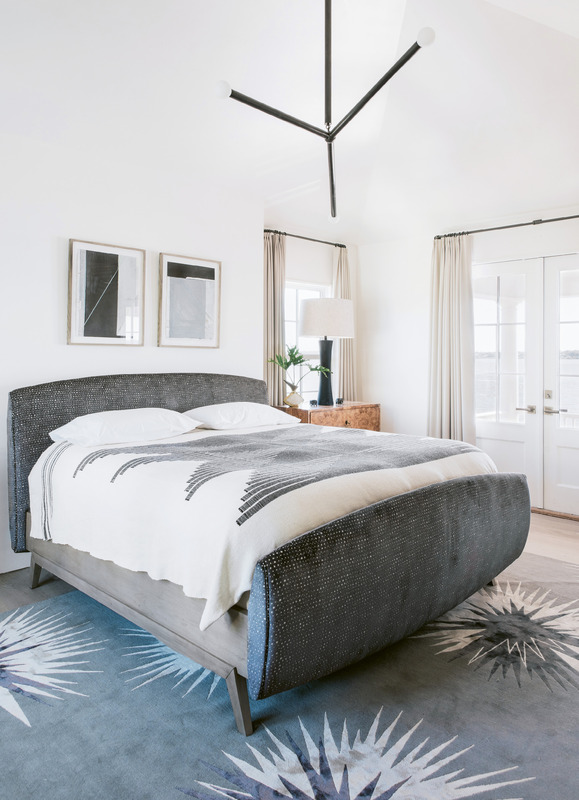 In the guest room, textiles—such as draperies by North Carolina-based Adelene and accent pillows by Kelly Wearstler—add subtle patterns and texture. In the master suite, vaulted ceilings soar over a plush bed by Habel for Hickory Chair; a burl-wood chest adds unexpected warmth. In the bath, floating custom cabinetry by Kris Kotlowski of Eurocraft Inc. echoes the cupboards in the kitchen. Even the his-and-her closets, which separate the bedroom and bath, provide harbor views. It’s hard to say which provides a better view: Charleston Harbor or the homes that preside over it. On any given day, a steady stream of locals and tourists alike can be found strolling along the tip of the peninsula, admiring the coastal panorama to the south and the parade of cornice-, column-, and veranda-festooned properties to the north. So when Molly and Ted Fienning bought a rare empty lot on Murray Boulevard with the aim of building a new home for their young family, they knew that in terms of architectural design, the bar was sky-high. The duo and their kiddos—Sawyer, six, and Fox, two—landed in the Holy City in 2013 after Ted, a Sumter native and Marine Corps F/A-18 fighter pilot, left active duty. (He’s still plenty active, though, serving in the Marine Corps Reserve and working in The Citadel’s Krause Center for Leadership & Ethics.) “Charleston has always held a place in my imagination,” Ted says. 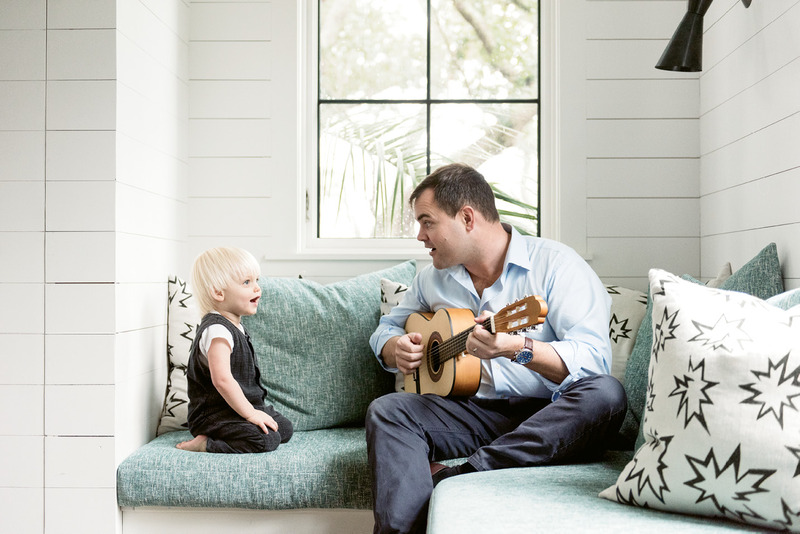 And, after turns in D.C. and rural Mississippi, the family felt they’d found their sweet spot: “Charleston is the perfect mix of a dynamic, progressive city for me and South Carolina’s lifestyle and roots for Ted,” Molly notes. 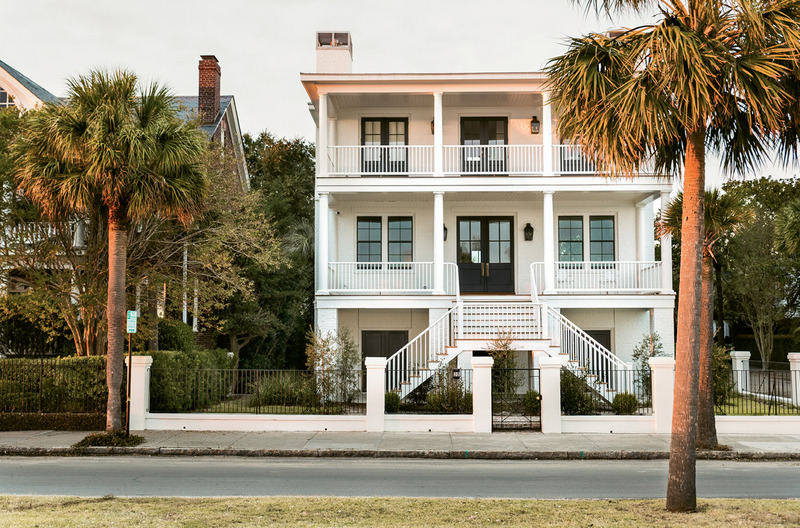 Given their love of downtown, the couple originally planned to restore a historical home, but while renting South of Broad, realized the proportions commonly found in older homes just weren’t the right fit. “We wanted a very open ground floor to maximize light, flow, and the ability to have lots of friends and family over,” Molly explains. One evening, while walking by the water, a “For Sale” sign on a lot overlooking the harbor sparked an epiphany: Why not build from the ground up in the neighborhood they’d come to love? 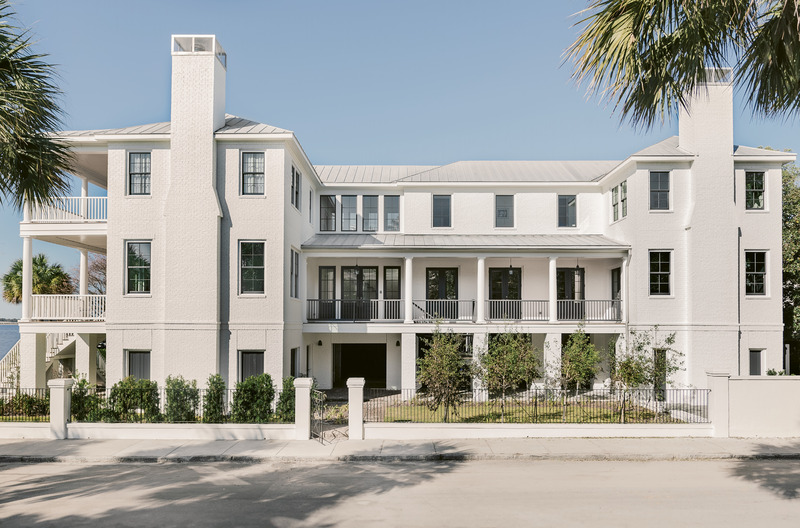 Although Murray Boulevard from Tradd Street to South Battery wasn’t developed until 1911, the couple wanted their new abode’s design to respect the South of Broad historical aesthetic. Yet Molly, a born-and-bred New Yorker, also craved a loft-like space that felt fresh and modern. Melding such seemingly opposing design goals sounds like a tall order, but it was the perfect challenge for these two: as the co-founders of Babiators, a line of fashion-forward but super-durable sunglasses for kids carried by national retailers such as Saks Fifth Avenue and Nordstrom, as well as local shops Sugar Snap Pea and Wonder Works, the Fiennings are practiced at blending classic style and modern functionality. 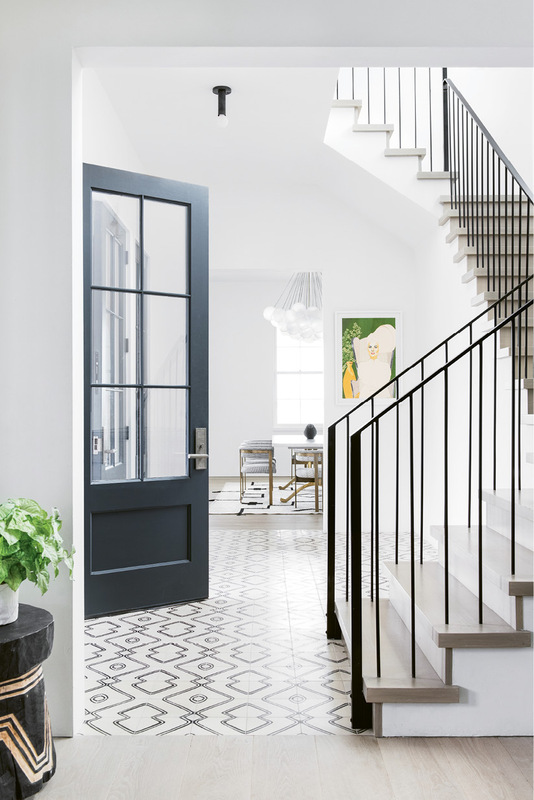 They found a kindred spirit in architect Heather Wilson, known for her clean-lined yet traditional designs that fall under the “modern farmhouse” umbrella. After soliciting feedback from their soon-to-be neighbors (over cocktails and pimiento cheese, of course) and the city’s stringent Board of Architectural Review, Wilson and the Fiennings landed on a unique U-shaped design that checked all the right boxes and turned to builder Brett Elrod, of C.B. Elrod Co., to bring it to fruition. Inside, the mix of old school and au courant continues. The Fiennings tapped Sullivan’s Island-based design pro Cortney Bishop to oversee the interiors. “I was excited to interpret this young family with ties to New York moving South of Broad,” Bishop says. The designer kicked things off by curating a palette of timeless, high-quality finishes and materials to use throughout the space. 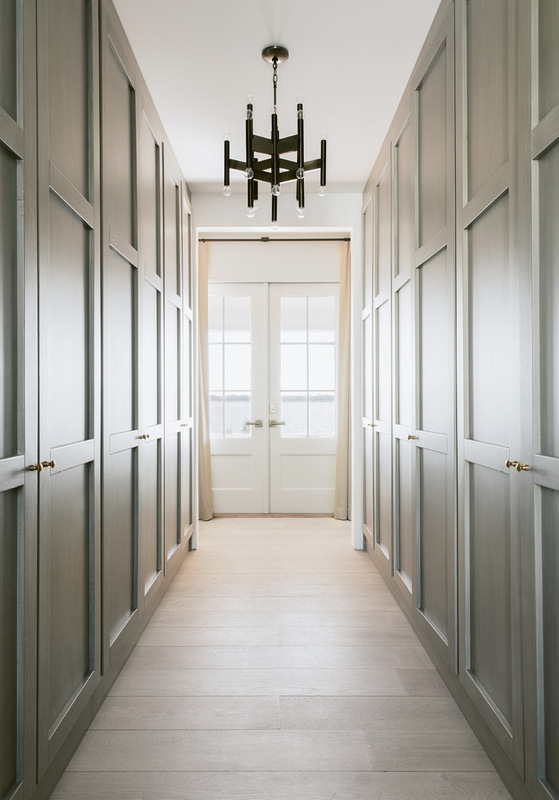 Wide-plank French oak flooring, plaster walls courtesy of craftspeople from the American College of the Building Arts, shiplap, and two paint colors—a custom shade of white and “Wrought Iron” by Benjamin Moore—are all classic enough to stand up to the home’s formal façade. From there, Bishop layered in furnishings and decor that reflect the Fiennings’ playful nature. 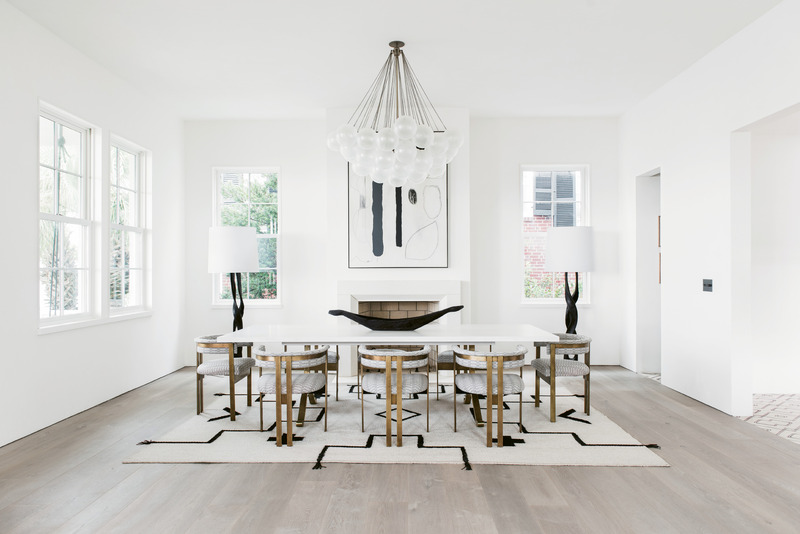 Wilson punctuated the connected, open-concept family and dining rooms with dueling fireplaces; Bishop riffed on this symmetry with twin “Cloud” chandeliers by Apparatus, matching geometric rugs by Merida, and complementary large-scale abstract works by North Carolina artist Brian Coleman. “The matching rugs and light fixtures and the similarity of the Coleman paintings all have a serenity that pays homage to the architecture,” Bishop notes. Both rooms also feature sculptural furnishings (such as Kelly Wearstler dining chairs and a wing chair in the manner of Hans Wegner) that resemble works of art. Still, the space is comfortable enough for family living. A recent afternoon found Sawyer plopped on the couch, deeply engrossed in The Boxcar Children—one of Molly’s favorite book series from childhood. In the evenings, this spot is the backdrop of many a dance party, complete with disco lights. “Everyone takes turns playing his or her favorite songs: something by Imagine Dragons for Sawyer, “Cha Cha Slide” for Fox, The Who for Ted, and Rihanna for me,” Molly says. Even the textiles have a sense of humor: in the playroom, pillows in “Pow” fabric by Kate Loudoun Shand reference comic-book art; in the powder room, a modern toile wallpaper by Rifle Paper Co. for Hygge & West features illustrations of the wonders of the world. 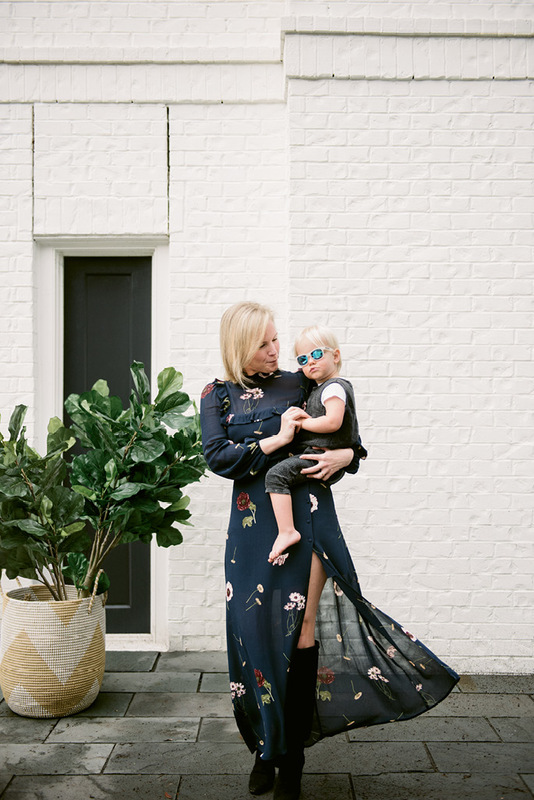 “Certain locales have significant meaning to our family already, and I love how the boys can learn about the others as they grow,” Molly explains. The kitchen provides another haute but highly livable space. Built-in banquettes and Verellen chairs covered in a punchy Peter Dunham fabric offer ample seating around a concrete-topped table, where Molly perches to do Babiators work; the children tackle art projects; and post-kids’ bedtime, husband and wife enjoy glasses of wine. “This is one of my favorite nooks in the house, and we spend the majority of our time here,” Molly says.